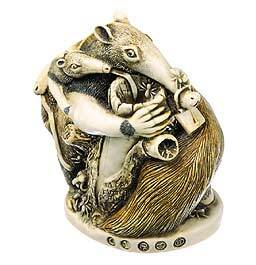 This box figurine features two adult anteaters and one youngster attempting a feast, but the nest of ants they seek is a force to be reckoned with. Seventeen ants fight back with hand grenades and a mousetrap. The mouse is in the small hollow of the tree trunk on the lid. The inside of the box reveals the anteaters’ family cookbook, complete with gourmet ant recipes, hence the title, “Antipasto.” Inscriptions include “Leaf Futters Rule,” carved on the tree, which should have read “Cutters,” but Peter’s knife slipped. (Leaf Cutter is a type of ant). “Good Luck Kimberly” refers to an HK collector who was expecting a baby at the time of carving. “40x” refers to the fact that anteaters’ sense of smell is 40 times greater that of humans. Hallmarks include ©, heart, HBC logo, ed.#, and Pc.